Some of the HTML/CSS templates on this site include custom styles that makes it possible to build easy-to-read layouts for small-screen mobile devices such as the iPhone and Android mobile phones. Today, a new page has been added where these custom mobile template designs are highlighted: The mobile website templates page. It shows the mobile layouts as they appear on an iPhone screen, and there are links to live demos of the mobile layout of each template directly from the gallery page. While none of the templates are based on responsive design principles, it may still be a good starting point for those who want to quickly build custom mobile websites. Future templates built with responsive layouts will be included as well. 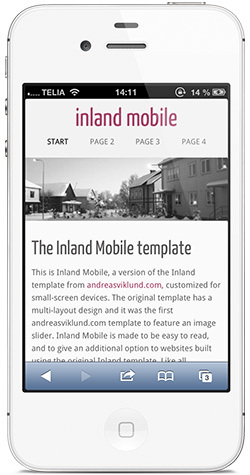 With the addition of this page, I also released Inland Mobile, a small-screen version of the Inland design. It features a simple mobile layout (as seen in the screenshot attached to this post) that can easily be added to sites built with the original Inland template. Feedback on the small-screen layout would be very welcome, and there will be similar updates to all templates in the Inland series over the next couple of days. You can download Inland Mobile here. Thank you Andreas for your awsome templates. I will use one of these for my new ultraportable site. Nice mobile templates! I’m sure they will be very popular among the vast wordpress community. I miss the details of how this template can work with the standard for typical screens. I think everyone is waiting for the next mobile versions of your authorship. Will the iPhone differ from other agents such as Android whenever you access the site? I am also trying to convert my site to integrate a mobile version but most plugins require to change your site’s template. Anyway, thank you for this share! Thanks Andreas for Very informative post. I was looking for information about this topic and this post really helped me a lot. Thanks for sharing. I still don’t understand about the concept and installation of mobile theme. For example in domain xxyyy.com I use general wp theme on my web. But, I want to use the mobile theme also in the same domain. What should I do? Do I have to instal new web in sub-folder of the same domain (for example: xxyyy.com/mobile) or what? Is this template multilingual? Can i translate it easily (language file)? I like that it has a clean and sleek design that shows good on an iphone. Certainly will try it out. Very simple, but funcional template. It works in both vertical and horizontal directions. For better impression I centered header picture. Your mobile version of inland is so beautiful. Are you still working on releasing more inland style templates such as the wood and hembygd ? I would love to see them. Thank you. very good template. i like your mobile version. i would like to try it in my web. thanks Andreasviklund.